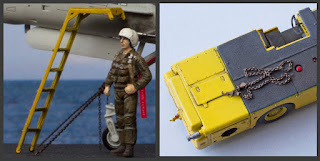 In this short article I am presenting another installment of my 1/72 models of miscellaneous ground support & carrier deck equipment items used by the U.S. Navy. This is by no means an exhaustive list of the Navy's GSE: I only model such items that I need for my present and future dioramas, and only those that I could collect sufficient historical information for. Historical Information: These types of lightweight portable platforms were utilized for aircraft servicing and maintenance by all branches of the U.S. military. 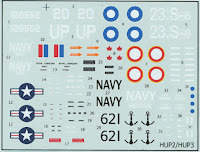 Paint scheme: USN items typically ocean grey; sea blue and olive drab also possible. Model Details: Both items are scratch-built with the aid of custom-made photo-etched metal parts. Historical Information: Employed to tow various types of U.S. Navy and Marine Corps aircraft on aircraft carriers as well as on shore stations. Time period: Mid-1950s - 1960s. Model Details: Scratch-built from plastic. Historical Information: When taxiing, steering on the U.S. Navy carrier-based jets was initially achieved through differentially applied main wheel brakes, and later by means of nose-wheel power steering. However, on a carrier deck a tiller bar, handled by a deck crewman, was often employed for more precise steering, especially when lining up with the catapult track (see more details in an article by Tommy H. Thomason: link). Different tiller bars were needed for different aircraft types. Model Details: Scratch-built from plastic and metal wire. Historical Information: Early models of the A-4 Skyhawks (specifically, the Wright J65-engined A-4A, A-4B and A-4C), unlike other U.S. Navy carrier-based jets of the period, utilized a very peculiar engine start arrangement: the engine had to be started mechanically by means of a rotating metal shaft inserted into a dedicated receptacle from the outside, and the shaft, in turn, was driven by compressed air obtained from a standard tractor-mounted jet start unit. The rather bulky but man-portable apparatus, made specifically for the early Skyhawks, was known as the "starter probe". Time period: For as long as the said types remained in service (1955 - mid-1970s). Paint scheme: Typically insignia red. Model Details: Scratch-built from plastic and custom-made photo-etched metal parts. Historical Information: Many different types of aircraft wheel chocks were used by the U.S. Navy throughout the years; what I present here is only a small selection. Time period: (A) – 1920s - 1930s; (B) – 1930s - 1940s; (C) – 1940s; (D) – 1940 - 1960s. Paint scheme: Light grey, insignia red or orange yellow. Model Details: Scratch-built from metal wire and plastic. Historical Information: All aircraft on the U.S. Navy aircraft carriers are secured to the deck when not taxiing, taking off or landing. Tying down was initially done with stout ropes, but in the early 1960s, with the aircraft weight constantly increasing, metal chains came into use. Time period: 1960s - present time. Paint scheme: Chain links - invariably rusted metal; hook assemblies - natural metal, insignia red or orange yellow. Model Details: A metal chain is not an easy object to model, and, from the accuracy perspective, the best way to imitate it would be to use a real chain. The chains I am showing here came from a company called Shipmodeling (Verf' na Stole), have 16 links per cm and are the smallest that I could find. 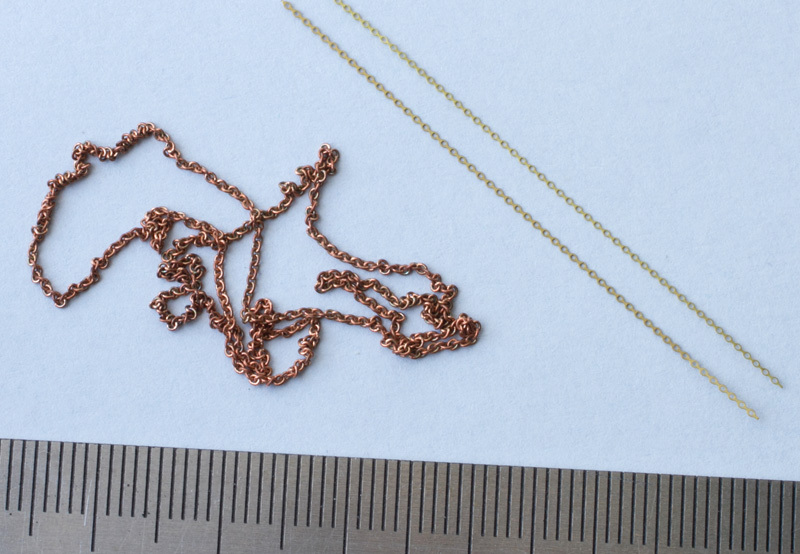 However, these "real" chains are relatively expensive, and it is not easy to make such a chain tout, especially in a confined space under the wings or the belly of your 1/72 scale model. Photo-etched chains (mine came from a set by White Ensign Models #7209), while less realistic than the "real" chains, are therefore usable when you have to imitate an aircraft secured to the deck with multiple chains, or when the access is restricted. U.S. Navy. BuNo 9675 / 2F4. VF-2B. NAS North Island, circa 1937. There is no particular story behind this small vignette. An F2F-1 of Fighting Squadron 2 is parked on the apron of a Naval Air Station, while two pilots are in conversation nearby. 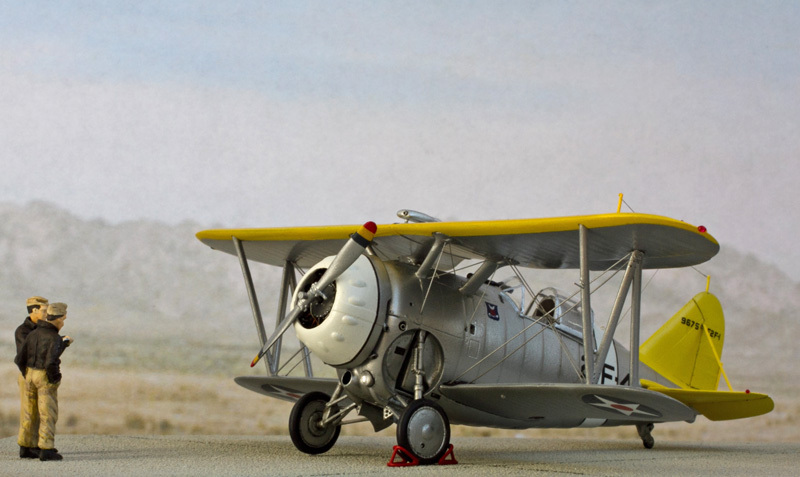 F2F-1 from Attack Squadron (kit # 72068), 1:72 scale. 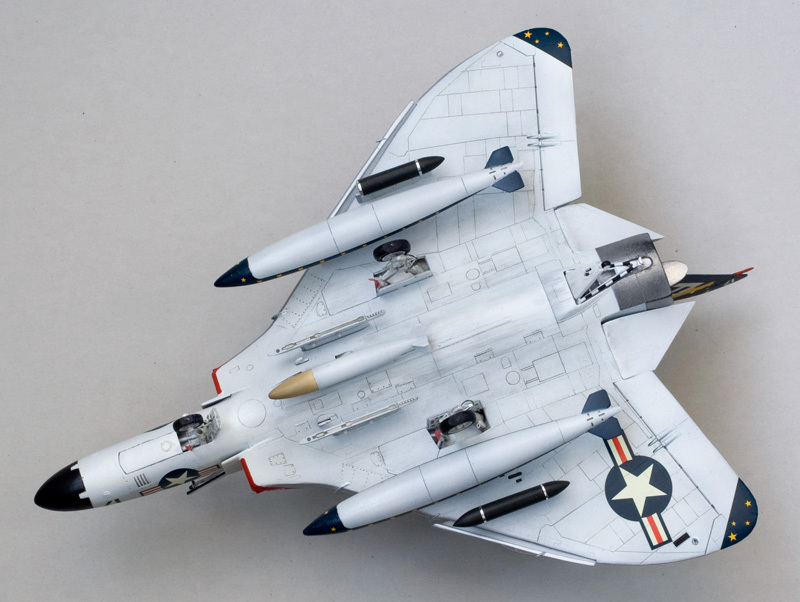 1) The too prominent rib running the whole length of the kit's belly was deleted; some minor details visible on the belly of the real aircraft were added. 2) Small gaps between the elevators and the fuselage, not present on the real aircraft, were rectified. 3) The kit's photo-etched pilot restraints were replaced with more historically accurate ones from an Eduard's generic set. This was the only improvement I've decided to make inside the cockpit. 4) Unusually for its time, the F2F-1 had movable horizontal stabilizer. Historical photographs show that in most cases a parked F2F-1 had its horizontal stabilizer in a negative angle of attack position, with the elevators drooped. Thus, this is the configuration that I replicated on my model. 5) Scratch-built trimmer added to the vertical stabilizer. 6) Oil cooler intake, carburettor exhaust and engine exhaust pipes drilled out. 7) Engine ignition wiring scratch-built (the kit's photo-etched part is, in my view, way too thick and contrasts unfavourably with the minuscule detailing of the engine itself). 8) Cockpit step and shell ejector chute openings cut out on the starboard side of the fuselage. 9) Scratch-built Pitot tube added to the port N-strut, scratch-built Venturi tube added to the starboard fuselage side. 10) Gun barrels scratch-built from thin metal tubes. a) Landing light on the port lower fuselage. b) Coloured navigation lights – two on the upper wing tips and two on the upper wing surface, plus one clear navigation light on the aft end of the tail cone. c) Five formation lights – one dorsal, two on the lower wing and two coloured ones on the horizontal stabilizer leading edges. 12) All external bracing and antennae wire imitated. 13) A gun camera of the type seen on many Naval aircraft of that era, including "my" F2F-1 BuNo 9675, was scratch-built. As a prototype for my model I wanted an aircraft covered by good historical photographs, with some hopefully in color. These criteria are met by the F2F-1 BuNo 9675 assigned to the VF-2B, and this is the variant that I selected. The top surface of the upper wing is Chrome Yellow (note that the yellow overlaps the leading edge), while the Lemon Yellow tailplane designates a unit assigned to USS Lexington and Insignia White trim with thin black border marks the leader of the 2nd section in the squadron. 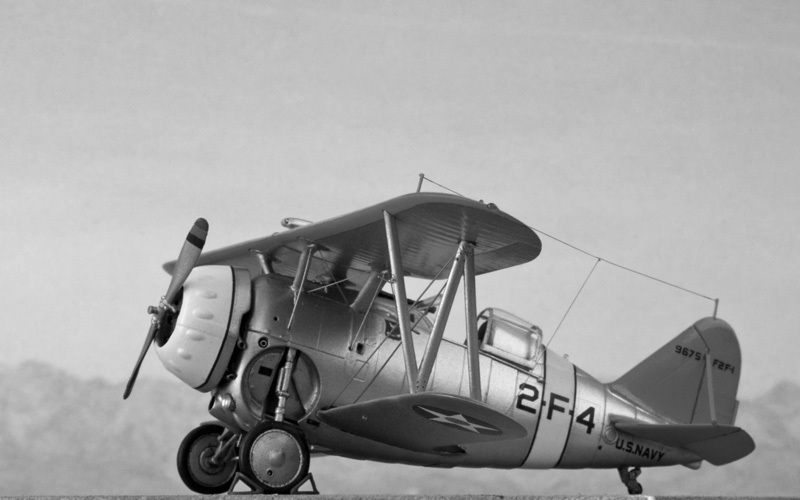 A careful study of historical photographs (see source ) will tell you that this machine, as well as its stablemates, had its fuselage painted in silvery Aluminium Dope color and not in Naval Aircraft Grey, as prescribed by the Navy's earlier directives and as the kit's instructions advise. The rest of the airframe is also Aluminium Dope, and "my" BuNo 9675 appears to have had it polished to a natural metal-like shine (see historical photograph: link). Unfortunately, the kit's decal is defective to the point of being totally unusable (colors are out of register, all elements are pixelized), so I designed the required letter & numeral decals in accordance with historical photographs and had them custom-printed. The national insignia came from a generic decal sheet by Techmod. The vignette base is sheet plastic. The pilot figures came from CMK # 72110 set and were slightly modified to make them Navy rather than Air Force guys. Grumman Biplane Fighters in Action | Aircraft in Action Series # 160 | Squadron/Signal Publications, 1996. 5.1. In regards to the paint scheme, this particular kit's instruction sheet is not alone in suggesting an incorrect fuselage color. Even the massive monograph "US Navy & Marine Corps Aircraft Color Guide" by the well-known author John M. Elliot says nothing about the fact that somewhere in the second half of the 1930s the prescription to paint all external metal & wood surfaces in Naval Aircraft Gray, very clearly given in the Navy's specification still applicable at that time (SR-15a), was de-facto abandoned, and that most of new aircraft types of that era had their fuselages painted in Aluminum Dope. There are many historical photographs that clearly show overall Aluminum fuselages on late 1930s and early 1940 USN planes; I am giving just a very small selection: SBC-3 (link), SOC/SON (link), F3F-2 (link), TBD-1 (link), BT-1 (link), SBD-1 (link), XFL-1 (link), XSB2C-1 (link), XF5F-1 (link). Still, in many cases model kit manufacturers and modelers alike seem to be putting their trust in texts and not in actual historical photographs. 5.2. It amazes me how often you see modellers declare that they won't build resin model kits, implying that resin is the reason for that self-abstention. Scale modelling is a bit like madness, and surely there are multiple different kinds of this madness... Still, for me the key factor in any scale model is its accuracy; after accuracy, I value the level of detail and the quality of molding/casting. If the model is accurate and of good quality, then the medium – be it plastic or resin – is of no importance to me. Moreover, it is my view that a high-quality, well-designed resin kit would in many cases be easier – and not harder! 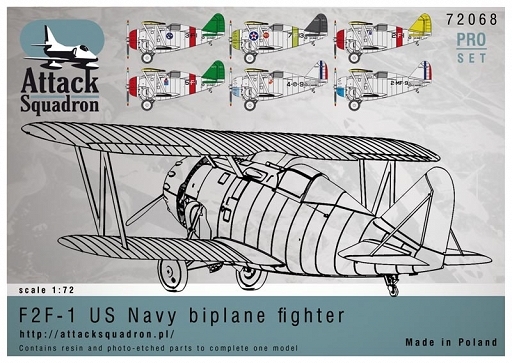 – to build than a plastic model of the same or similar type of airplane. 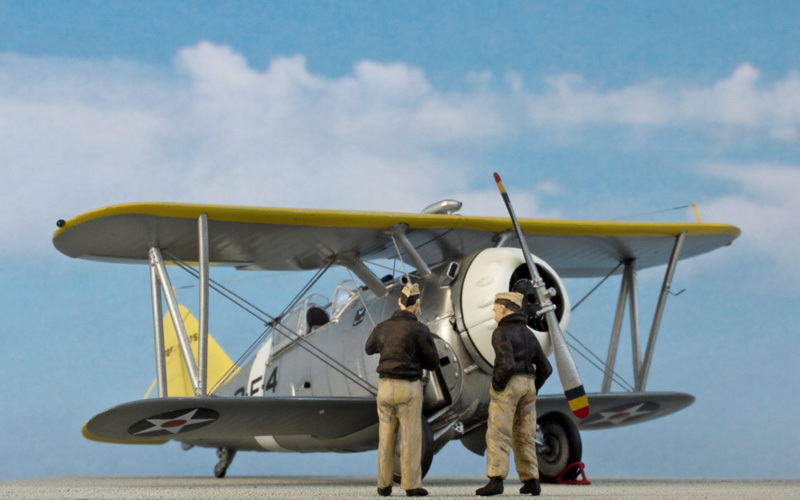 The Grumman F2F-1 kit by Attack Squadron is an excellent proof. 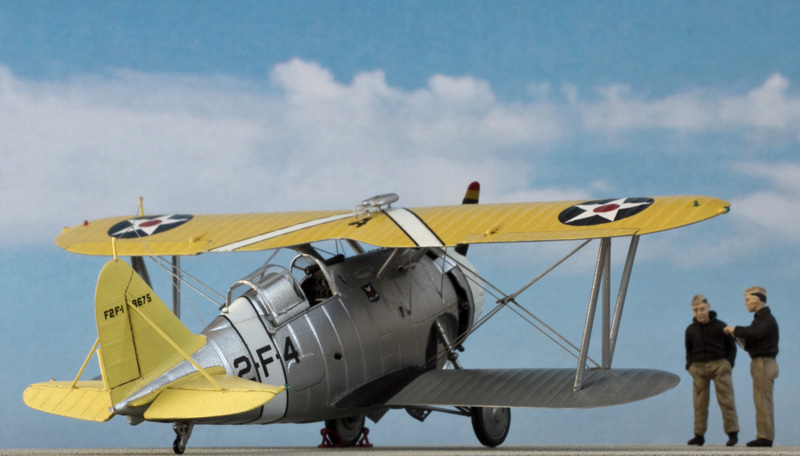 Building this resin kit was immensely easier than building plastic kits of Grumman FF-1 and Grumman F3F-1 by Special Hobby and MPM respectively, all three being biplanes of the same size and layout. 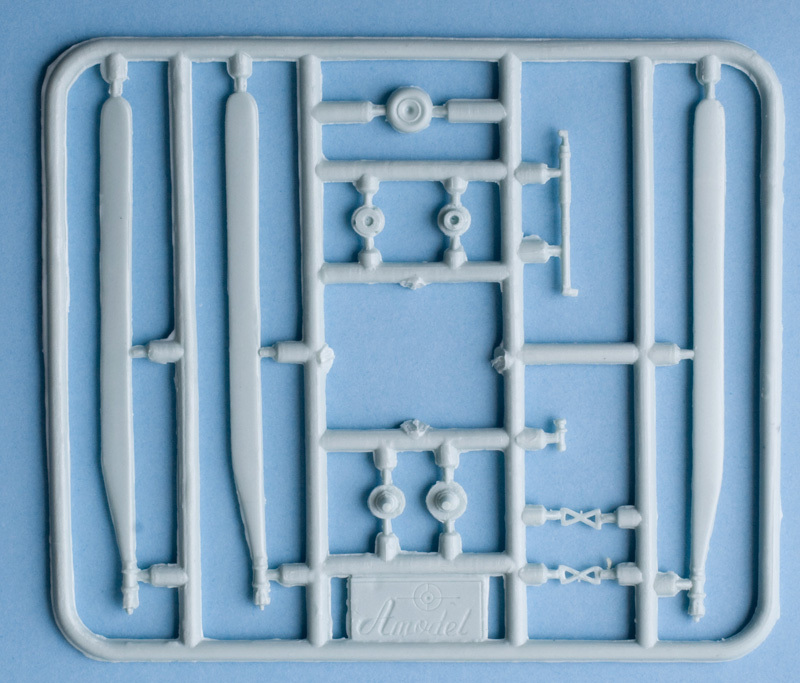 Here is just one example: where the Attack Squadron's resin kit parts had minuscule tabs and respective recesses to correctly position and align them, the two aforementioned plastic kits offered no such amenities for the most challenging subassembly of any biplane kit – the wing box, with its associated cabane struts and interplane struts. Basic information on the Grumman F2F-1 is available in Wikipedia (link) and will not be repeated here. The box is very compact (16 x 11 x 3 cm) and extremely sturdy, the parts are safely packaged in multiple zip-lock plastic bags with bubble wrapper serving as shock absorber. There is no boxart to speak of. Instruction is printed in one black & white and one color A4 sheet. It provides detailed recommendations on building and painting. The quality of casting is excellent. All surfaces are smooth, with very delicate recessed and raised (where appropriate) details. Special thanks to Attack Squadron for not marring the fuselage with "bullet hole"-style rivet lines; that would have killed this tiny bird. In terms of accuracy, I can't see any serious issues. The only thing I slightly doubt is the prominence of the "seam" running the whole length of the kit's belly. Everything else matches what I see on the historical photographs, which are not many; and since not a single F2F-1 survived, we won't have any additional technical information on this particular type, unless something buried deep in some archives is suddenly unearthed. - Nicely detailed engine complete with minuscule curved exhaust pipes. - Good cockpit interior (although Aires has long been producing resin cockpits with crispier and finer details in the same scale). - Thickness is as close to being scale-wise as possible in a number of critical parts, such as the engine cowling and wing and stabilizer trailing edges. 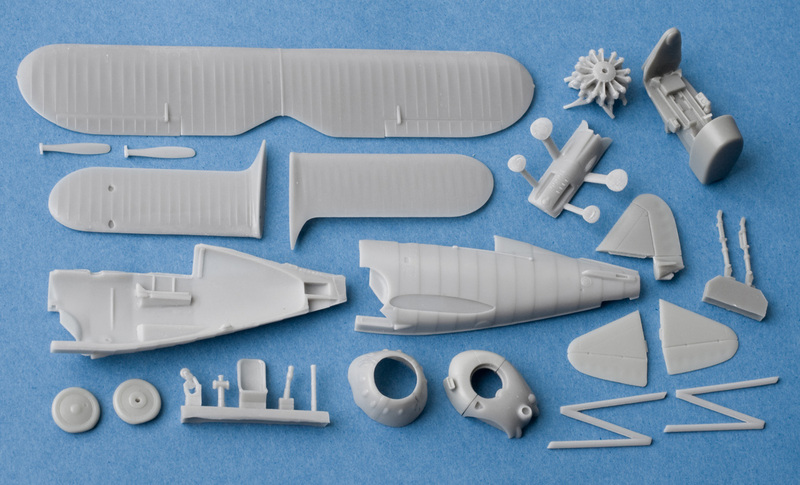 However, after a rather disappointing surprise with the Attack Squadron's F8F-1 Bearcat kit (see my detailed review here), I decided to review the F2F-1 kit only when all of the resin parts are separated from their bases and could therefore be test-fitted. Fortunately, here the problems of the Bearcat kit do not reappear. There is one relatively minor issue that I can see: there are small gaps between the elevators and the fuselage which are not present on the real aircraft. 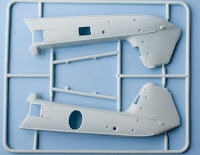 - the upper wing and the part comprising the upper forward fuselage and wing support posts. - I don't think that making main landing gear legs photo-etched rather than resin is a good idea. It might appear good from the durability perspective, but from the perspective of historical accuracy an F2F-1 landing gear leg is tubular, it is not comprised from two bars, each rectangular in cross-section. To hide the seam between the two photo-etched metal strips that comprise each leg, you'll need several layers of primer and some very careful sanding. - Propeller blades and hub are offered as 3 separate parts, and I don't particularly enjoy assembling it while having to guess at the correct pitch angle of the blades. I don't think it's technically impossible to cast a one-piece two-blade propeller; some of the resin kit manufacturers are doing so. The kit contains a vacu-formed canopy of excellent quality, clear and thin. I see no inaccuracies in its shape. A small piece of film for the instrument panel is also included. However, no clear items are provided for either landing light (which on the F2F-1 is prominently positioned in the nose – a very unusual feature for a prop fighter) or navigation lights. 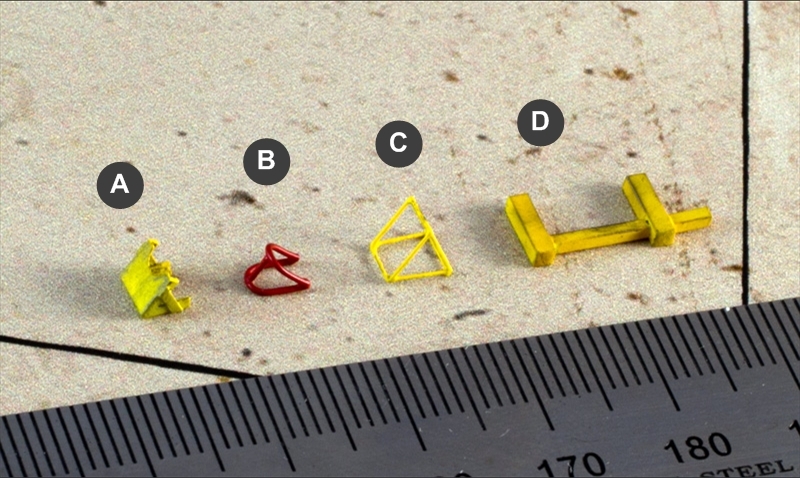 These small items – perfectly easy to do in terms of 3D modelling and resin casting technology, but tedious to scratch-build from a chunk of clear plastic – is what the absolute majority of model kits in the 1:72 scale are lacking (and no, the "common wisdom" of simply painting your plastic parts clear red/green over silver just doesn't do the trick). Clear navigation lights were present in the Attack Squadron's earlier F8F-1 Bearcat kit, but sadly the company did not follow that practice up with their F2F-1 kit. The quality of etching is very good, but it is a pity that the manufacturer did not provide photoetched metal parts to replicate the biplane's rigging (also known as flying wires). 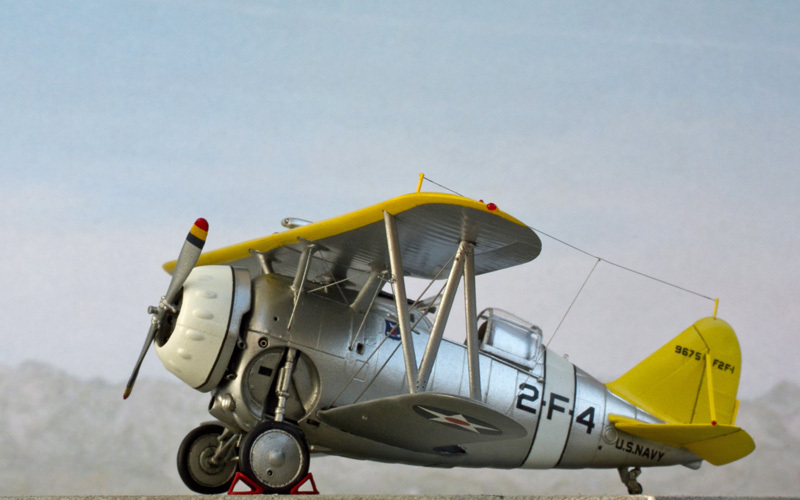 The flying wires on the U.S. Navy biplanes were flat strips of metal, i.e. not round in cross-section. The classic practice of making biplane rigging from stretched sprue or polyester fiber, while being extremely tedious in all cases, is also historically inaccurate when applied to airplanes like the Grumman F2F-1. Photoetched metal rigging (similar to items produced by Starfighter Decals for the Curtiss F11C and SBC kits) would have made construction considerably easier and resulted in a more accurate model. A) BuNo 9624 / 3F1. U.S. Navy, squadron VF-3B. 1936. B) BuNo 9673 / 5F1. U.S. Navy, squadron VF-5. 1937. C) BuNo 9367 / 7F13. U.S. Navy, squadron VF-7, USS Wasp (CV-8). 1936. D) BuNo 9997 / 4F9. USMC, squadron VF-4M. 1937. E) BuNo 9646 / 2F1. U.S. Navy, squadron VF-2. 1937. F) BuNo 9663 / 2MF9. USMC, squadron VMF-2. 1937. Regrettably, the decal is defective in a number of ways (right-click on a picture, select "Open in new tab" from the context menu, then in the new tab enlarge the picture to 100% scale so that you can see all of the issues described below). 1) The colors on the decal are printed out of register. 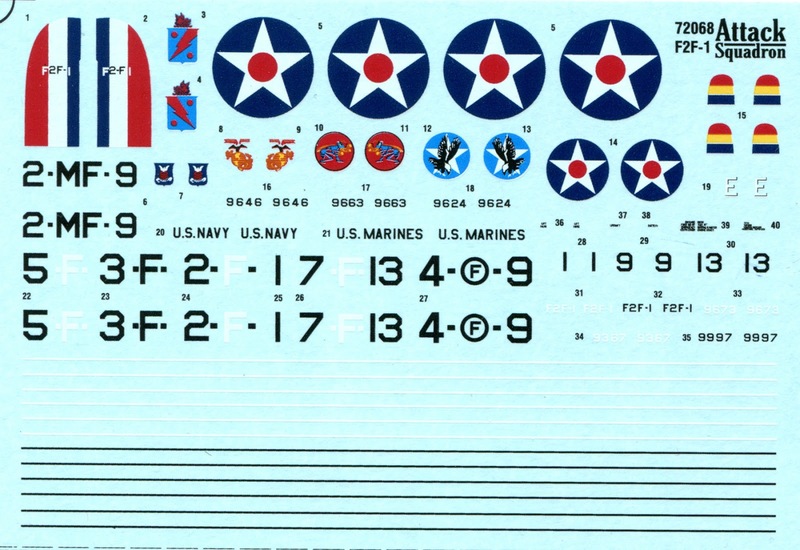 That makes all 6 decal/markings variants unusable: all elements (the lettering of the Marines variants over the tail stripes; the unit badges of the Navy variants; the "E" letter denoting excellence; the propeller tip stripes; etc.) are out of alignment. 2) Apparently, the resolution used when printing this decal was not high enough: the contours / edges of the decal items are not straight / smooth, they are jarred and "pixelized". 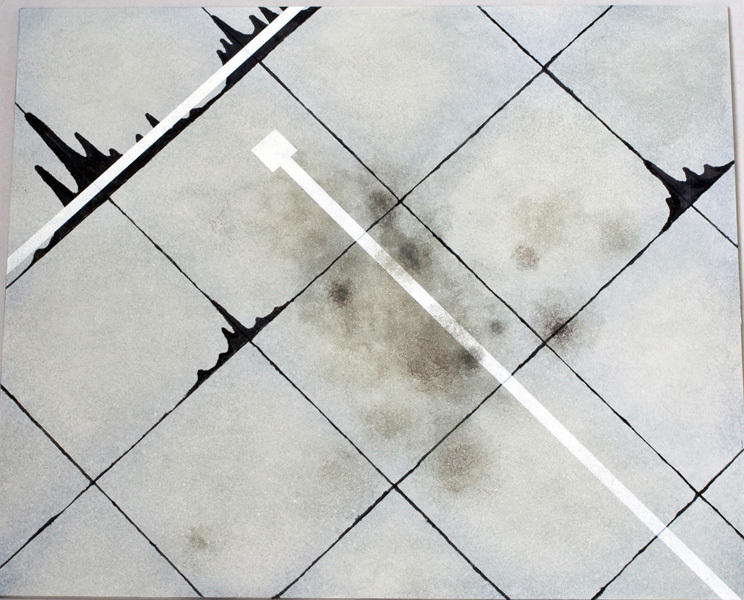 The "steps" ("pixels") can be seen with unaided eye on nearly all items on this decal. These two problems are very serious: essentially, they mean that the decal supplied with this kit cannot be used. 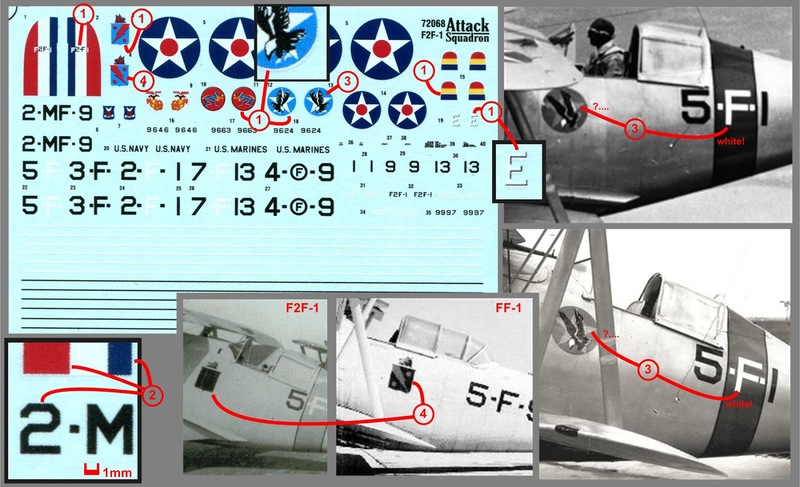 It has to be noted that the decal that came with the Attack Squadron's F8F-1 kit did not have such problems: all its elements were in register, and there was no "pixelization". Therefore, the question is not about technical impossibility, but about quality control with the decal supplier. There are some other issues that are not related to the quality of printing, but rather to historical accuracy. 3) Variant A: the white color that is used to print the star on the "Screaming Eagles" squadron badge is questionable. I haven't seen any color photographs that would show this badge on a Grumman F2F-1, but available black & white photographs show that the star is substantially darker than other nearby markings (such as the letter "F" in the aircraft's tactical code) that are definitely white. 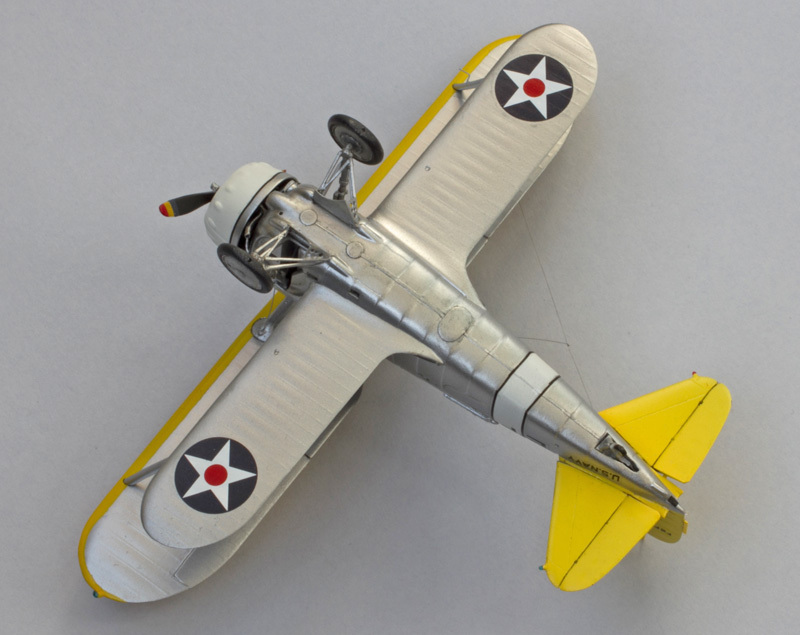 Furthermore, color photographs that show the "Screaming Eagles" squadron badge on their later aircraft are available, and there the star is definitely yellow. 4) Variant B: the light blue color that is used to print the shield on the "Red Rippers" squadron badge is questionable. Period black & white photographs as well as later color photographs of the "Red Rippers" aircraft suggest that the blue used on their badge is not light in shade: it looks like the standard Insignia Blue, i.e., dark blue. 5) Variant C: the BuNo 9367 supplied for this variant is incorrect. This number belonged to a Grumman FF-1 fighter, not to any of the F2F-1's. BuNo's assigned to the F2F-1's were as follows: 9342 (XF2F-1); 9623 through 9676; 9997. 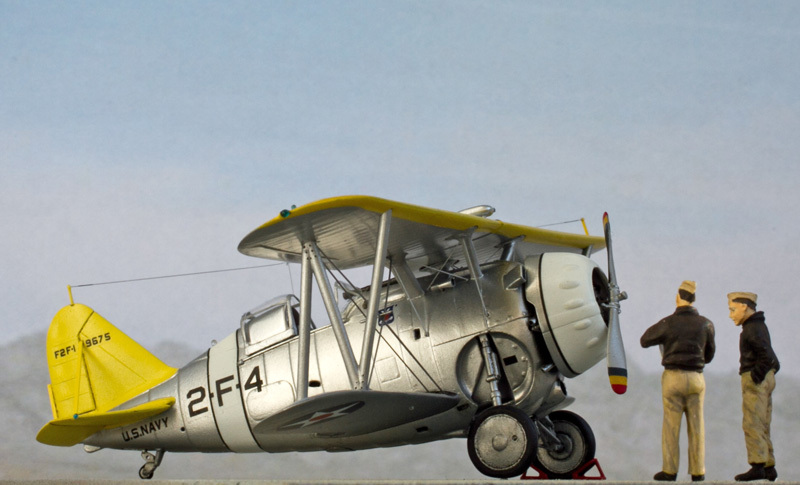 As of summer 2017 there are no other 1:72 scale model kits of this aircraft in production, but in distant past there have been a couple of vacu-formed models. 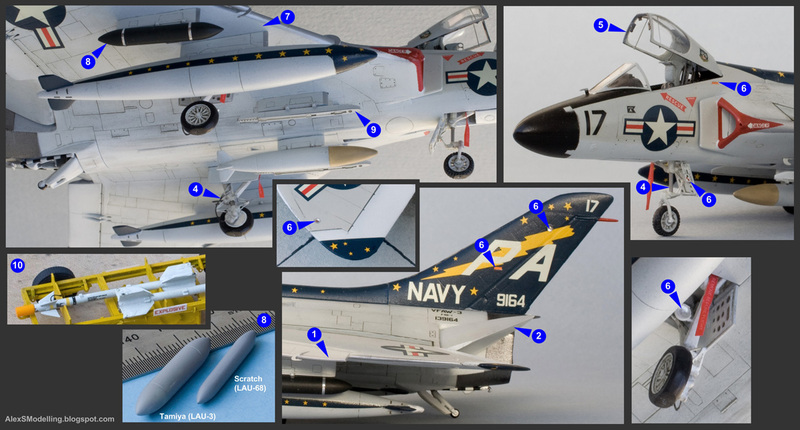 As for the aftermarket stuff, it seems that the only item relevant to the Grumman F2F-1 is the R-1535 resin engine produced by Starfighter Decals. Considering the intricate exhaust pipework that is integrated into the F2F-1 engine, I'm not sure that the Attack Squadron's model would benefit from this good but apparently generic aftermarket R-1535. - High accuracy; no visible shortcomings in geometry. - Very good level of detail for a 1:72 scale kit. - Excellent quality of casting. - Vacu-formed canopy and photoetched metal parts included. - Decal is totally unusable due to serious printing defects: all elements are out of register and "pixelized". This is a major shortcoming for a kit priced at E32. Considering the defective decal, it is curious to see what the typical reviewers – those of the "My sincere thanks to ABC Company for this review sample" persuasion – are saying. In one such review we read the following: "Decals are exceptionally done and appear to be spot-on, registration-wise. Colors are really well done." So.... look once again at the high resolution scan of the decal in my article above, and then choose for yourself what you want to believe. Basic information on the HUP Retriever is available in Wikipedia (link) and will not be repeated here. The box is a top-opener of moderate size (26 x 18 x 5 cm), too large for the enclosed plastic frames measuring no more than 15 x 12 cm. The cardboard is thin and soft. 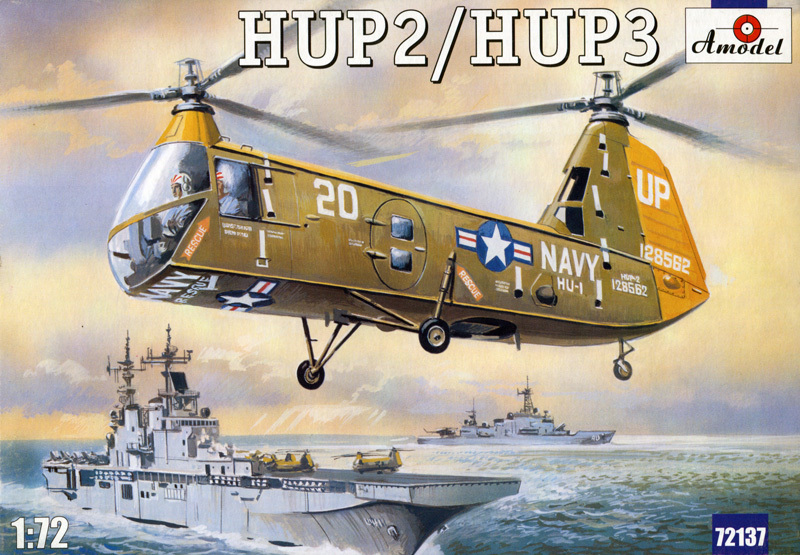 The boxart is funny: it shows a U.S. Navy HUP-2 in inaccurate paint scheme (olive instead of historically correct Engine Grey), as well as in historically inaccurate setting: it is shown overflying a ship that is clearly the USS Wasp, LHD-1, commissioned in 1989 (that is 25 years after the last of the Navy's Retrievers was withdrawn from use). Instruction is printed in on one black & white A3 sheet. Guidance on assembly is clear enough. Guidance on painting is full of inaccuracies, but I will come to that later (see section 3). 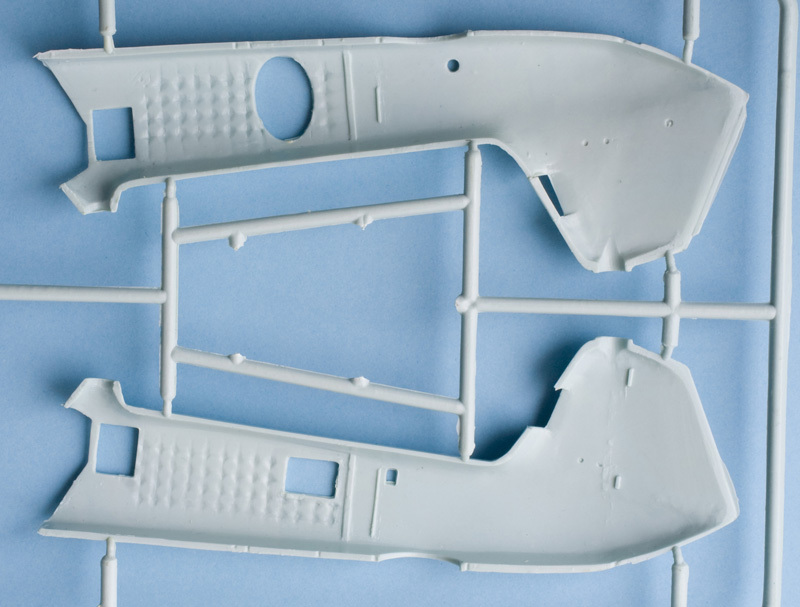 The surface of plastic parts is smooth, engraved panel lines (very few of them, actually) are not too wide. Unfortunately, these are the only nice words that can be said about this kit. a) In cross-section, the kit's fuselage has a nearly flat top and a completely flat bottom (similar to that of, say, CH-47 or Yak-24). This is entirely inaccurate: the fuselage cross-section of a real HUP was a nearly perfect oval. b) Aft rotor pylon shape is totally incorrect: it must be taller, and both its forward and trailing edges must be closer to vertical. c) The kit's forward rotor pylon shape is incorrect; observe how smoothly the pylon blends with the fuselage on a real HUP: photo. d) Aft rotor pylon should have four large cooling openings, not two as presented in the kit. It should be noted that some machines had the two lower openings closed with special metal covers, but it was only practiced very early in this helicopter's service life. e) The main landing gear leg attachment points on the kit are put too far aft. f) Cabin door must be slightly wider and located a bit lower and more forward. g) The rescue hoist hatch in the cabin floor is totally omitted in the kit. The internally mounted rescue hoist and its requisite cabin floor hatch are very curious features of the HUP design and should not be overlooked. h) The shape of the ventral cooling opening is incorrect: it must be an elongated octagon, not a circle: photo. i) The indentation on the starboard fuselage aft of the main landing gear strut mount is not a transparent window, as suggested in the kit, but a refueling receptacle. j) The shape of the starboard cabin window is incorrect: it must be an octagon, not a rectangle, and positioned a bit more forward in the fuselage. 2) Rotorhead detail is nearly non-existent in the kit. This is how the rotorhead of the real thing should look like: photo. 3) The shape of rotor blade tips is inaccurate in the kit. The blade tips must be square. 4) Most of the kit's cabin interior appears to be fictional. The pilot and co-pilot seats are inaccurate. The passenger seats are missing, although, in all fairness, it would be impossible to mold these webbed seats accurately in plastic. Furthermore, it appears that the HUPs serving with the Navy's operational units did not have any insulation on the cabin walls and ceiling, so that the fuselage structure, the rescue winch and even some of the forward rotor transmission were clearly seen. As an example, here are some photographs that show what the cabin interior of a real operational HUP looked like: link and link. 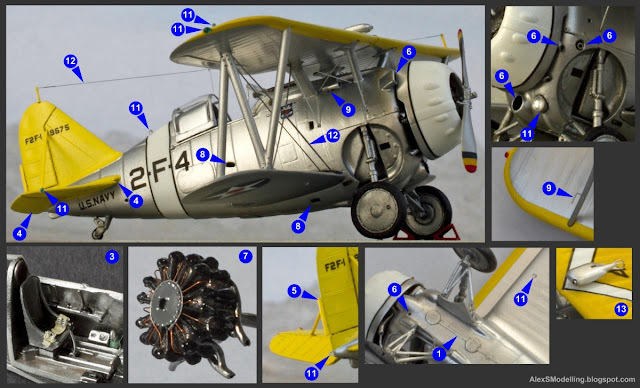 5) The kit's representation of the engine and the aft rotor transmission is a complete fiction. For instance, the R-975 engine that powered the HUP had a single row of 9 cylinders, not two rows as represented in the kit. This is not a tragedy in itself, as on a real helicopter the engine is not actually visible behind a tangle of pipework and mounts; it just shows that the kit manufacturer did no research whatsoever: the R-975 is a well known engine (it was used to power Sherman and Lee tanks and Hellcat tank destroyers, among others), and even a cursory search will tell you it has a single row of 9 cylinders. 6) Landing gear legs, if used as given in the kit, will result in the fuselage sitting unrealistically high above ground. In other words, the kit's landing gear legs are "unloaded" and thus inaccurate for modelling the helicopter in a typical stationary / parked pose. 7) Quite a few of the smaller details are missing in the kit, such as the landing lights and navigation lights. However, considering the magnitude of problems with the fuselage, such smaller detail issues seem to be unimportant. To conclude this section, it appears that the Amodel kit was designed basing on the quite detailed but very inaccurate drawings published in "AviO" # 2 (Kharkiv, 1992) magazine: the kit fits these drawings perfectly. Clear plastic items are very thick; their transparency is seriously compromised by molding imperfections and distortions. A) HUP-2, BuNo 128562 / UP20. U.S. Navy, squadron HU-1. Early 1960s. B) HUP-3, Serial No 51-16621. Royal Canadian Navy, squadron VU 33. Late 1950s or early 1960s. C) HUP-2, BuNo 130077 / 23S6. French Naval Aviation (Aéronavale), squadron 23S. Late 1950s or early 1960s. 1) The kit's instructions recommend painting the airframe Olive Drab, which is, of course, incorrect. Only the U.S. Army H-25A Army Mules were painted Olive Drab: example. As for the Red Orange trim exact placement, the kit's instruction is also incorrect: there must be a wide Red Orange band on the forward lower fuselage, and the "step" in the Red Orange trim on the top of the aft rotor pylon is in reality much less pronounced than the kit's instructions suggest. 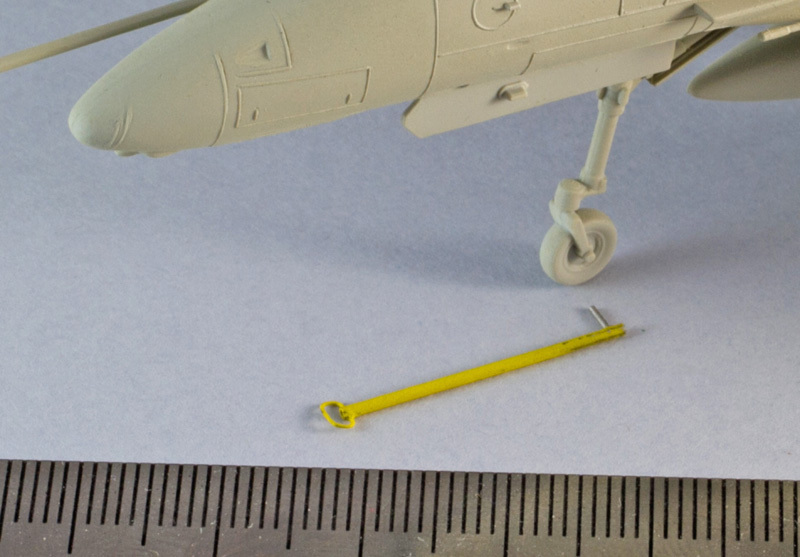 2) The kit's instructions recommend painting the rotor blades black overall with yellow tips. This in incorrect. First, rotor blade upper surfaces must be Light Gull Gray. 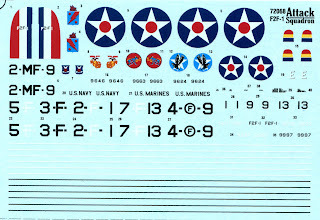 Then, as the Navy's SR-2e regulation states (taken from the definitive work on the U.S. Navy and Marine Corps aircraft colors and markings by John M. Elliot), "matched sets of main rotor blades" are to have the first 2 inches of each blade tip painted an identifying color - Insignia White, Insignia Red and Light Green – with a 6 inch band of Orange Yellow inboard of the tip color (while "unmatched sets of main rotor blades" are to have all blade tips in Orange Yellow). I don't know whether all of the Navy HUPs did use matched sets of rotor blades, but a number of available historical photographs clearly show that differently colored blade tips were in fact present. As an example, see color historical photographs here (search for "HUP-2" on this page). 3) The kit's instructions recommend painting the cabin interior Light Grey. Most probably this recommendation is accurate for BuNo 128562; however, we should remember that some of the HUPs had Interior Green cabin interiors. 4) The kit's instructions provide no recommendation on this, but all of the interior visible through the four large openings on the aft rotor pylon must be painted the same color as the helicopter's fuselage. 5) The proportions of the U.S. national insignia on the decal are incorrect: the red stripes are too thin, the blue border around the white star is too thick. 6) All of the codes on the decal ("UP", "20" and "128562") are printed using inaccurate font. Historical photographs of this particular machine as well as of other contemporary HUPs in Engine Grey & Red Orange paint scheme show us that all symbols had 60 degrees, not 45 degrees corner cuts. 7) The font for the "NAVY" fuselage side letters is inaccurate on the decal. The decal's letters are too narrow (in relation to their height), and the bars in "N", "A" and "V" have different thickness. 8) Historical photographs show that there were several variations of markings on the HUP fuselage lower surface. 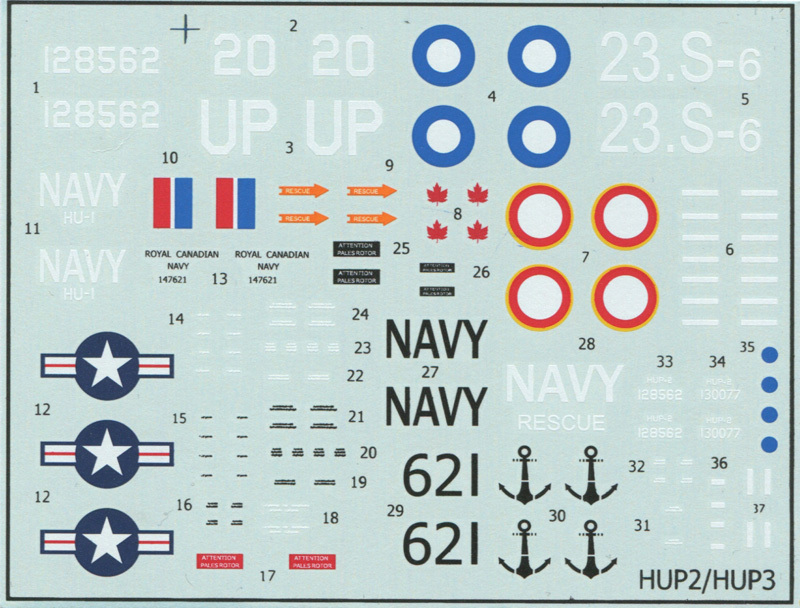 The kit's decal and instructions suggest the following variant (from nose to tail): "Navy" > "Rescue" > national insignia. This could have been the case for some of the machines; however, historical photographs show that HUPs in Engine Grey & Red Orange paint scheme, assigned to utility squadrons, had "Abandon Chute" or "Remove Chute" lettering, and not "Rescue". In particular, photographs of BuNo 128562 suggest that the markings on the lower fuselage were as follows, from nose to tail: "Abandon Chute" (white letters on Red Orange background) > national insignia > "Navy". 9) The "Rescue" arrows on the decal are orange. This is incorrect: these arrows must be Insignia Red. 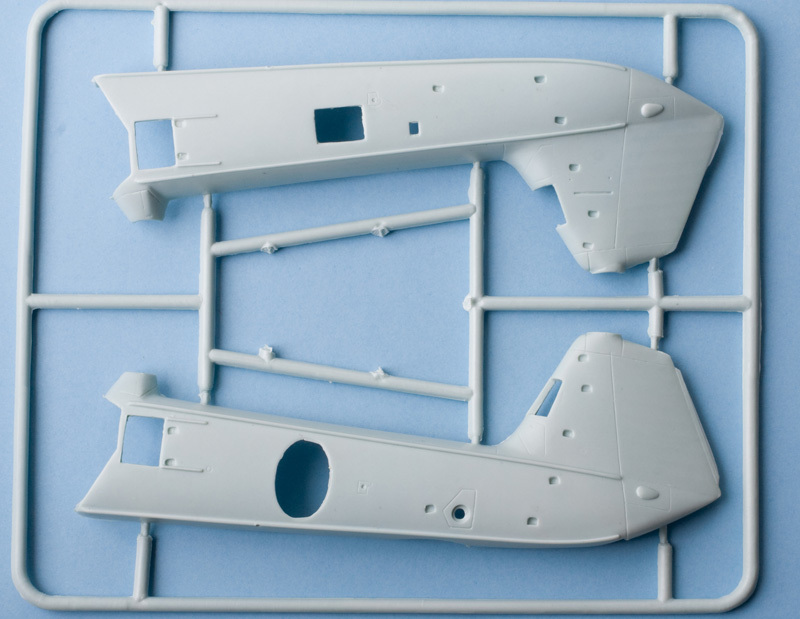 10) The kit's instructions recommend painting the airframe light grey overall, which is incorrect. Royal Canadian Navy helicopters of that time period, including the Retriever, wore the two-tone scheme: Dark Sea Grey upper surfaces and Medium Sea Grey lower surfaces and sides. 11) The kit's instructions recommend painting the fuselage band and the top of the tail rotor pylon yellow. I could not find a single historical photograph that would confirm the yellow trim; available photographs show the trim color to be red. 12) The shape of the red maple leaf on the national insignia does not appear to be historically accurate. 13) The font for the black "NAVY" lettering is inaccurate on the decal. 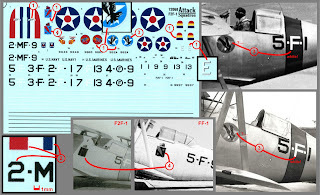 Compare the decal's letters with historical photographs. 14) The "147621" serial number present on the decal is historically inaccurate. Although Bureau Number 147621 was indeed allocated to a HUP-3, that particular machine has never served with the Royal Canadian Navy. 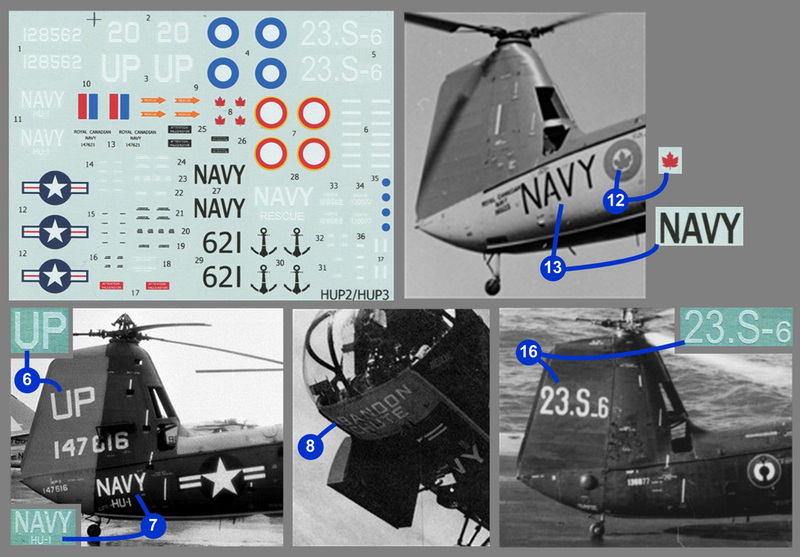 The Canadian machines (three in total) were actually ex-U.S. Army H-25A helicopters, and, although all of them did receive the U.S. Navy Bureau Numbers, they carried their U.S. Army serial numbers while in Canadian service. Their respective Army serial numbers and Navy Bureau Numbers were as follows: 51-16621 / 147622; 51-16622 / 147609 and 51-16623 / 147617. Each of the three Canadian machines had its large fuselage tactical number changed several times throughout its service life, but the "621" tactical number present on the decal was, according to source , associated with s/n 51-16621 during its service with Utility Squadron 33. 15) The "Attention pales rotor" legend on the decal is incorrect, as well as its black & white color. Royal Canadian Navy Retrievers had technical stencilling in English, not in French, and this particular warning placard read "Beware of forward rotor blade" in white capital letters on red background. 16) The font used for the white "23.S-6" side number on the decal is inaccurate. Compare it with historical photographs, and also observe that Aéronavale puts an underscore (_), not a dash (-) between the squadron letter ("S" in this case) and the individual machine number. 17) The "Attention pales rotor" legend on the decal is incorrect. On Aéronavale Retrievers this particular warning placard read "Attention avec pales du rotor avant" (in capitals). I have to conclude that, as is so often the case, this decal is apparently based on inaccurate color profiles from books or magazines and not on historical photographs. According to scalemates, the following other companies have released the 1:72 model kits of this helicopter: Siga (# 72-M07), YuMTK (kits # 005 and 006) and Mach2 (# GP.012). 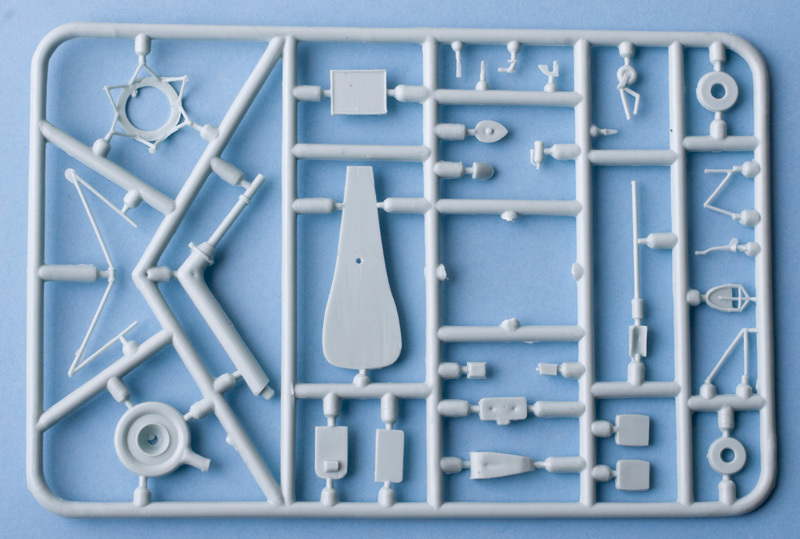 The model kit from Siga, although different in some minor detail, is clearly based on the same master parts as the Amodel kit and, therefore, must share all of its inaccuracies. I could not find any pictures of the YuMTK product at all, but I strongly suspect that this is the same model as released by Amodel and Siga; it is also possible that the YuMTK product is the original, while Amodel and Siga are reboxes. 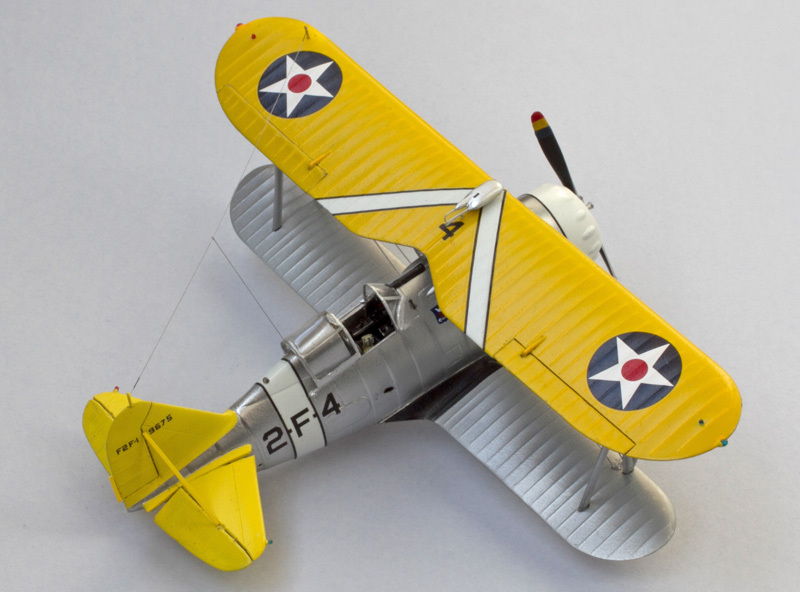 The Retriever from Mach2 is definitely their own kit, but, to put it short, it is very poorly cast and has a number of accuracy issues, as are most of the kits produced by this manufacturer (sadly, the people at Mach2 do not seem to have learned a single thing in their 20+ years of operations: their models released in 2016 have the same poor accuracy and poor quality of casting as their models from the 1990s). As for the aftermarket items, it seems that only one is available: a vacu-formed canopy from Pavla. Its transparency is very good, but the flat shape of its bottom is tailored to match the incorrectly shaped Amodel's fuselage. - Moderate price (approx. $11 paid at a local model shop in 2012). - The accuracy of this kit is horrible. There is hardly a single part that could be considered accurate, but worst of all is the fuselage, which is wrong in every respect. - Very thick clear plastic parts with poor transparency. - Decals for all three variants are totally inaccurate. a) There seem to be a persistent myth (repeated even in some of the printed books) that the Army's H-25A variant had larger cabin door. There are no indications that this was the case. Take a look at photographs of the real thing (such as these examples: H-25A and HUP-2) and see for yourself: the doors are identical in size, shape and placement. b) Another Internet myth states that there were external differences between the U.S., Canadian and French machines, and that somehow the shape of rotor blades and engine cutout of the Amodel kit are correct for the U.S. and Canadian variants but not for the French one, or vice versa. This is totally unsubstantiated; there were neither "Canadian-specific" nor "French-specific" Retrievers. The French Naval Aviation (Aéronavale) received standard HUP-2 helicopters from the U.S. Navy. The Royal Canadian Navy received ex-U.S. Army H-25A helicopters, which are externally identical to the U.S. Navy HUP-3 variant (except for some antennae). c) Take a particular note of the fact that as of early 2017, there seem to be no accurate line drawings of the HUP Retriever available on the Internet. All available drawings have multiple inaccuracies, and this includes drawings from such sources as the official U.S. Navy flight manual; wikipedia.org; "AviO" # 2 magazine; "An Illustrated Guide to Military Helicopters" book by Bill Gunston; "Helicopters. Military, Civilian and Rescue Rotorcraft" book by Robert Jackson; aviastar.org and various other sites. d) When researching paint schemes and markings, do not trust photographs of preserved and restored aircraft. These are very frequently painted and marked without regard to historical accuracy. You can rarely see historically correct fonts on a museum aircraft, and sometimes even such basic things as the national insignia are wrong, which really grieves me: museum workers are supposed to be capable of doing at least some research, aren't they. e) It would be wise to look at the technical condition of preserved and restored aircraft with a critical eye. Some of the preserved machines are sadly deteriorated. Yet others, while externally glossy and pleasing to the eye of a casual observer, do not retain their historically accurate configurations and may have some components removed and some replaced with non-authentic ones. For example, exhibits at the USS Intrepid, Kalamazoo Air Zoo and Fort Rucker museums all have non-authentic tail wheels. U.S. Navy. BuNo 139164 / PA17. VF(AW)-3. An F4D-1 Skyray of All Weather Fighter Squadron Three is being prepared for a routine air patrol from the Naval Air Station North Island. Ground crewmen are arming the fighter with Sidewinder air-to-air missiles delivered on a munitions trailer towed by a Clarktor tractor. A gas turbine aircraft start unit is standing by, ready to start the Skyray's engine. F4D-1 Skyray from Tamiya (kit # 60741), 1:72 scale. The Skyray kit by Tamiya is well-known and has been reviewed many times. In my view, it is an outstanding kit. The overall accuracy and the quality of moulds are exceptional. The fine surface details as well as interior details are better than on many newer kits released in the 2010s. 1) A curious feature of the Skyray design is its leading edge slats. They are entirely automatic and are controlled solely by aerodynamic forces. There are no provisions for the pilot to control these slats in any way; he can neither extend nor retract them. 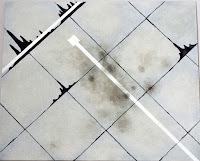 The slats automatically extend (fall down due to gravity) when the airplane slows down for landing, they remain extended on the ground and throughout the takeoff, and then they automatically retract when the airplane reaches a certain airspeed (and the windage overpowers the gravity). Ground crews may manually retract the slats when a particular Skyray is undergoing some maintenance, is slotted for a long-time storage or for receiving a paint job. 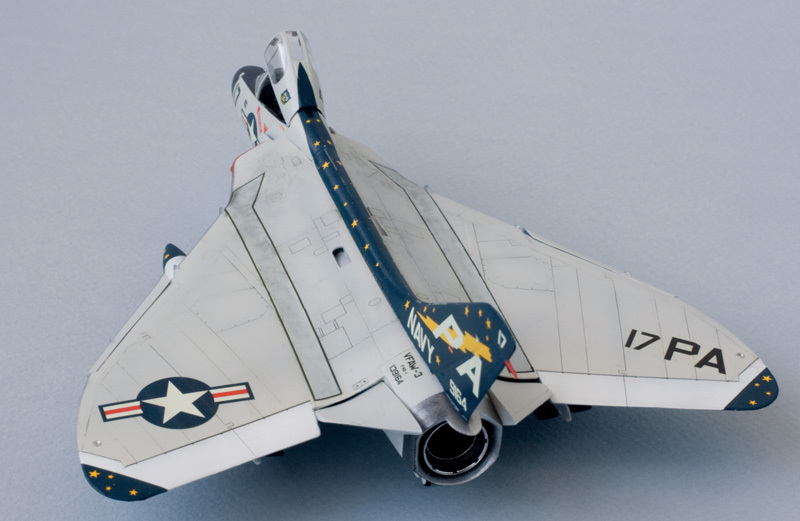 Any scale model that is intended to represent an operational Skyray ready for takeoff must have the leading edge slats extended. However, the Tamiya's kit has the leading edge slats molded shut. 2) Another curious feature of this airplane is its grotesque horizontal (pitch) trimmers. They are mechanically controlled by the pilot, and they had to be in an upward position for both takeoff and landing. Skyray pilots rarely bothered to lower the trimmers (that had to be done by means of hand-turning a wheel in the cockpit) upon landing only to be obliged to raise the same trimmers again prior to takeoff. Thus, an operational Skyray, on the flight deck or on the ground, is normally seen with the pitch trimmers tilted upwards. 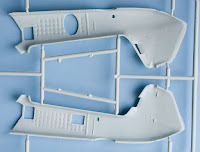 However, the Tamiya's kit has these trimmers molded in the neutral position. 1) Resin leading edge slats (CMK set # 7016) installed in the extended position. 2) Resin horizontal trimmers (CMK set) installed in the raised position. 3) The kit provides a hint of engine intake trunks interior and a good engine compressor face, yet I deemed the trunk interior not long enough and had to extend it a bit. 4) Landing gear legs enhanced with photo-etched scissor links and tie-down rings, oleos from metal rods, brake lines from thin metal wire and brake discs from metal foil. 5) Details added to the inside of the cockpit canopy, including canopy raising mechanism, rearview mirrors and vertical posts seen on side windows. a) Rectangular orange-colored formation lights beneath the canopy and on both sides of the vertical stabilizer were not present on Skyrays during the first years of their service but were installed on most (if not on all) aircraft somewhere around 1958.
b) Bright red dorsal and ventral anti-collision lights were not present on Skyrays during the first years of their service but were installed on most (if not on all) aircraft somewhere around 1961. Historical photographs of "my" BuNo 139164 indicate that the formation lights are present while the anti-collision lights are not. Air brakes are left closed, of course, as it should be on a parked Skyray (air brakes are designed to be used when an aircraft is airborne so as to facilitate weapon delivery, combat air maneuvering or landing; the Skyray's air brakes do not extend on their own accord and therefore are closed on a parked aircraft). 7) Pilot accounts (see source ) and historical photographs consistently point on the following fact: the Skyrays of VF(AW)-3 had their guns removed and gun troughs faired over. I have modified my model accordingly. 8) The kit includes rocket launchers which, judging by their dimensions, appear to be 19-shot LAU-3 pods. However, all available historical photographs of VF(AW)-3 Skyrays show that much smaller 7-shot LAU-68 pods were typically employed by this particular unit rather than the 19-shot variants. Lacking any out of the box LAU-68 rocket pods, I had to scratch-build two such items. 9) Sidewinder missile pylons were enhanced with some custom-made photo-etched details. 10) Two AIM-9B Sidewinder missiles came from an excellent set produced by Eduard (# 672036). To each of the missiles I have added an umbilical cord (which is highly visible on any Sidewinder variant) and a simple scratch-built protective cap. If your model shows an aircraft that is not yet preparing for takeoff with the pilot in the cockpit, than the extremely delicate IR heads of the Sidewinders must be covered by protective caps. The Eduard's set includes protective caps, but they are of a later variety than those used in the late 1950s and early 1960s. 11) Historical photographs of the VF(AW)-3 Skyrays show that they always carry a NavPac pod (containing VHF navigation and instrument approach marker radio and antennae) on the centerline pylon. The kit's NavPac is accurate and I used it without any modifications. 12) VF(AW)-3 Skyrays were never seen without the two 300-gallon external fuel tanks. 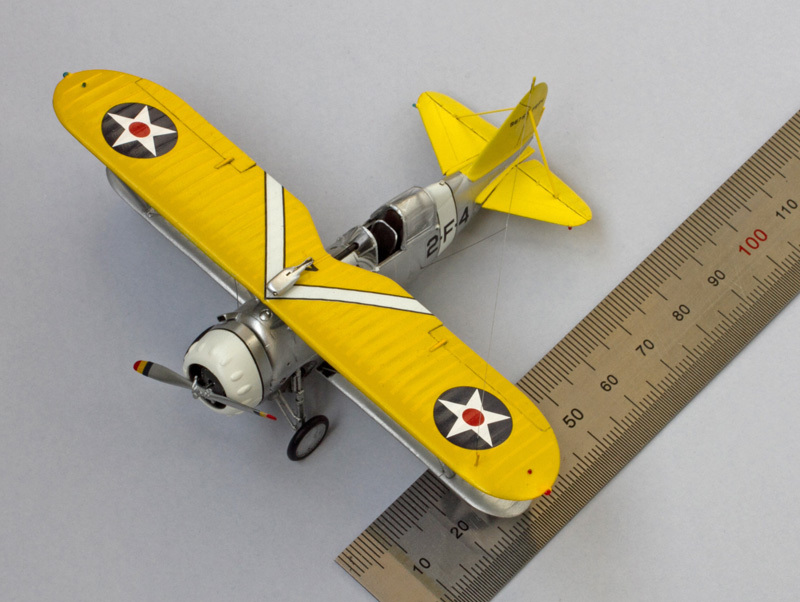 The kit's drop tanks are accurate enough in terms of both shape and dimensions (about 1mm too long, if we reference the diagram provided by Tommy H. Thomason here). - Resin main landing gear wells fit inside the kit's wings with considerable difficulty. When the model is complete, less than 30% of the wells are seen as the larger sections of both nose and main landing gear doors are closed at all times except when the gear is in the process of raising or lowering. - Resin nose landing gear well does not fit inside the kit's fuselage even when combined with the kit's plastic cockpit tub; forget trying to combine it with the CMK's resin cockpit tub. 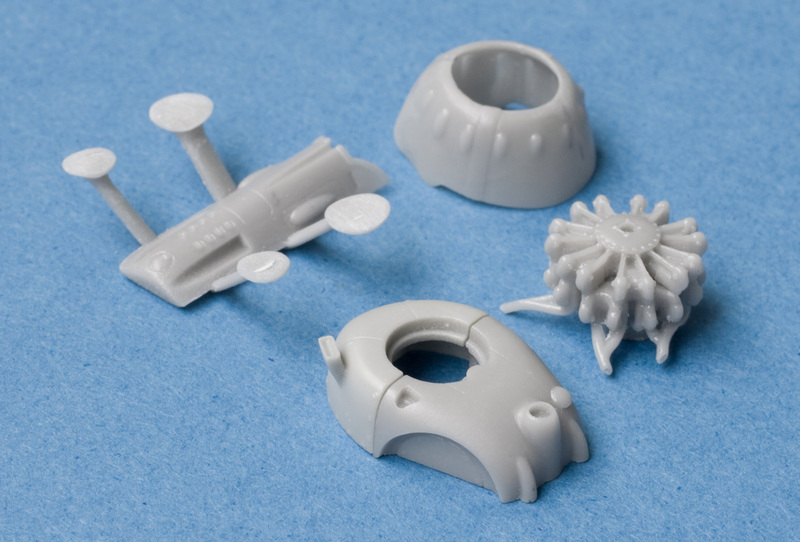 - Neither the resin cockpit tub nor the resin ejection seat offer any considerable improvement in terms of shape or detail when compared to the respective plastic parts. 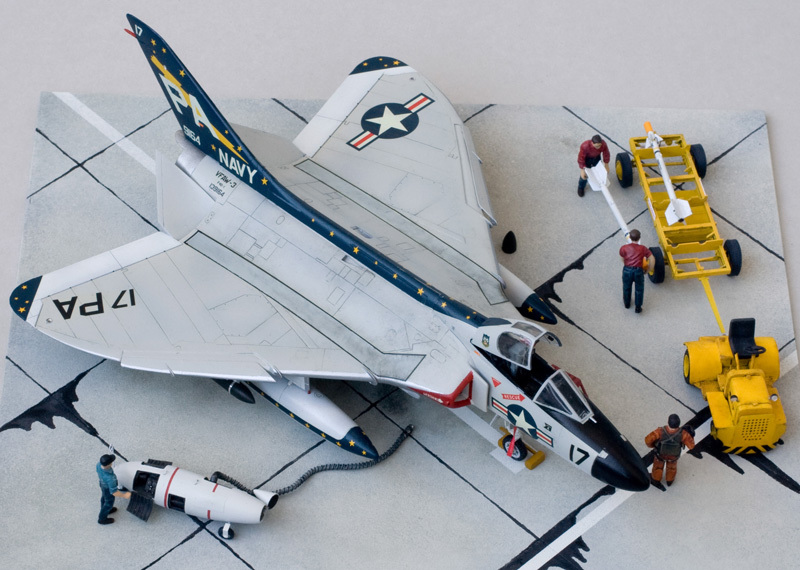 - Separately cast resin ailerons are unnecessary, as a parked Skyray typically has its ailerons in the neutral position. Furthermore, installing the resin items will ruin the control rods which are excellently cast by Tamiya on the plastic wing surface. - Separately cast resin rudder is nice; on the other hand, sawing off the rudder from the respective plastic part is easy (at least when compared to making the CMK's resin parts fit). 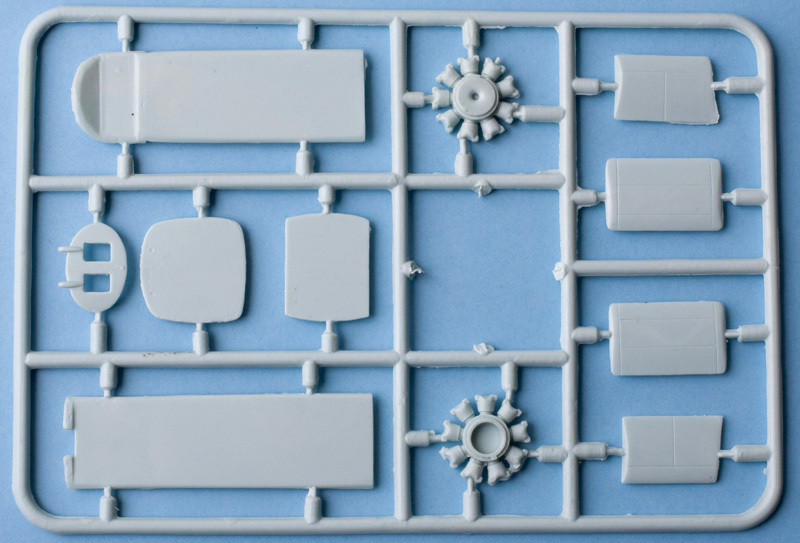 - Resin engine access panel is less detailed than the kit's plastic. Furthermore, this is not the panel that is frequently seen open on the real Skyrays undergoing pre-flight checks; presenting it open would only appeal to the modellers obsessed with finishing their kits as partially disassembled airplanes. - CMK's vacu-formed canopy does not bring any improvement in either shape or transparency when compared to the Tamiya's excellent plastic canopy. - CMK's radar and separate nose cone are nice, but I do not like the way the removed nose cone breaks the neat silhouette of the airplane. The aircraft carriers the standard Light Gull Grey over Insignia White camouflage scheme of the period. Miscellaneous markings are all done in accordance with historical photographs and include, among others, aluminum-colored wing leading edge and ordnance pylon leading edges; black radome and anti-glare panel; dark green rocket pods; dirty tan nose cone of the NavPac pod (the natural color of fiberglass). I have to note that Tamiya's instructions in regards to painting and markings are quite accurate, in contrast with instructions concocted by some other kit manufacturers, but still some aspects are omitted there, e.g. aluminum leading edges on ordnance pylons and dark blue drop tank fins. Also note that operational Skyrays, unlike most of the contemporary Naval aircraft types, had neither the leading edge slats interior nor the landing gear door edges painted Insignia Red. The kit's decals are used, although I had to re-paint the wing walkways as the ones provided on the decal sheet have an unrealistically yellowish hue. I used this historical photograph as an inspiration for my diorama and assembled the ground support equipment and crew figures accordingly. 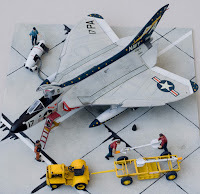 1) The diorama base is sheet plastic, painted by myself in accordance with historical photographs of the VF(AW)-3 Skyrays seen on the ramp of NAS North Island. It's not some pre-painted generic cardboard. And, yes, the black lines between the concrete panels are wavy (exactly as they are on historical photographs) because in the past such seams were filled with tar by hand. 2) Ground crew and pilot figures came from Hasegawa (# X72-7) and Airfix (# 1748) sets. As in my earlier works, I had to alter the crew's uniform and headgear to make them Navy rather than Air Force guys (how frustrated I am to see all kit manufacturers stubbornly producing crew figures in the Air Force attire, while no figures are available to represent non-modern U.S. Navy crews). 3) The U.S. Navy munitions trailer, adapted to carry Sidewinder missiles and rocket pods, was scratch-built basing on historical photographs. 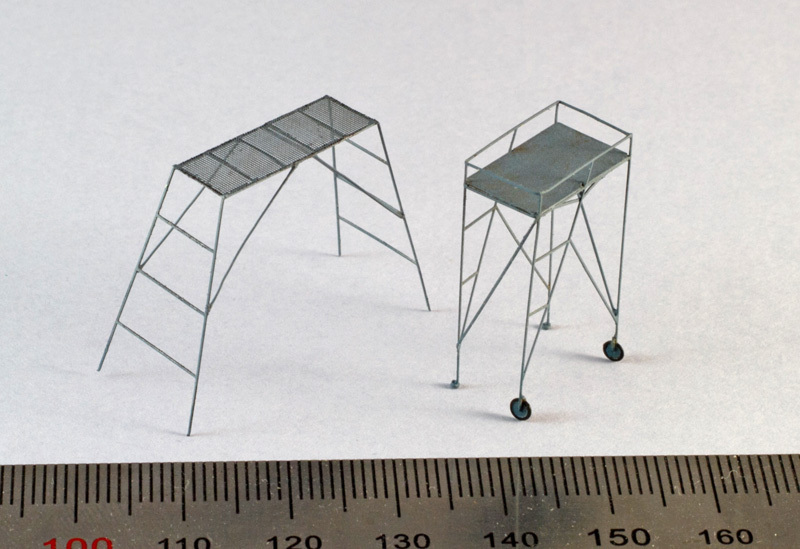 4) The model of air-transportable aircraft start unit, a very typical companion of Skyrays on land bases, is built from the kit produced by F4Models (cat. # 7019). 5) The Clarktor 6 tractor was widely used by the U.S. Navy on both aircraft carriers and land bases. Its model comes from the Academy's set # 13403, and it was heavily modified by me to achieve better accuracy. For more details see my article about carrier-based tractors. 6) The Skyray was one of the very few Navy airplanes lacking the self-boarding capability. Therefore, external access ladders were always needed for the crew to get to their cockpits (e.g. see this historical photograph). The ladder on my vignette is a small photo-etched item from F4Models (# 7014). 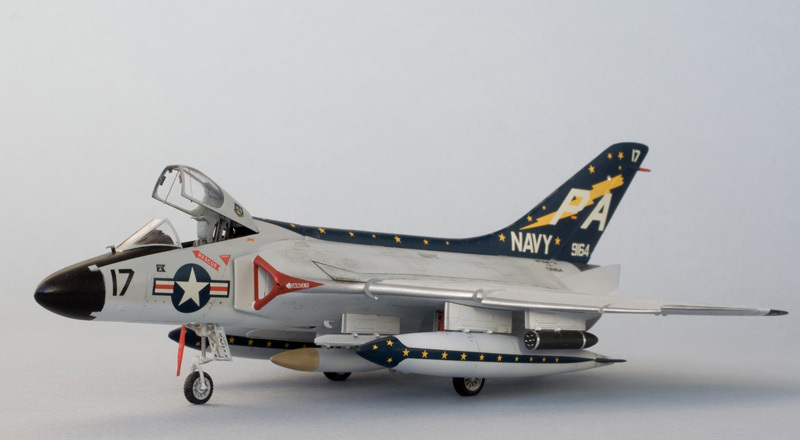 Douglas F4D Skyray | Naval Fighters Series # 13 | Ginter Books, 1986.